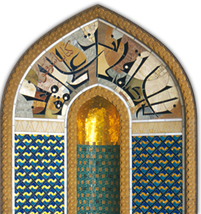 Oman's exhibition promoting tolerance, understanding and peaceful coexistence opened for the second time in the United States on October 2, 2014 at Kennesaw State University, located approximately 20 miles from Atlanta, Georgia. The university's modern campus in a rural setting is conducive to academic learning for the 25,000 students enrolled here. 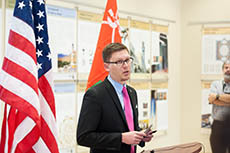 The American Association of State Colleges and Universities has awarded Kennesaw State University an award for excellence and innovation in international education, one of only two such awards presented among the organization’s 400 member institutions nationwide. On behalf of the President Daniel Papp, Dr. Daniel Paracka welcomed the approx. 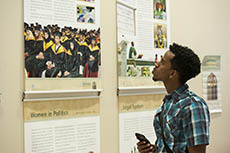 100 students, staff, faculty and guests in attendance at the exhibition opening, and introduced the other speakers. 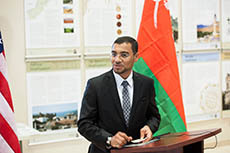 Representing the Sultanate of Oman, counselor Salim Al Kindi, and information attaché Hanan Al Kindi, from Oman's embassy in Washington, D.C., expressed their gratitude to the university for hosting the exhibition in such beautiful surroundings. 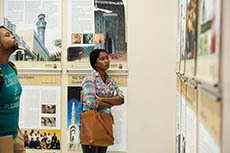 A member of the exhibition's organizing team, Michael Dickinson, offered a few words on the background and evolution of the exhibition, and distributed samples of genuine Omani frankincense, and DVDs with the documentary film "Religious Tolerance in Oman," produced specifically to accompany the exhibition.